Salivary gland cancer & thyroid cancer are often grouped together as head & neck cancers. However, both cancers are different and affect different areas of the body. Parotid glands are the largest salivary glands and are located at both sides of the face. In most cases, tumours found in these glands are benign. Submandibular glands are located under the jawbone. Sublingual glands are found underneath the tongue. Tumours found here are often malignant (cancerous). 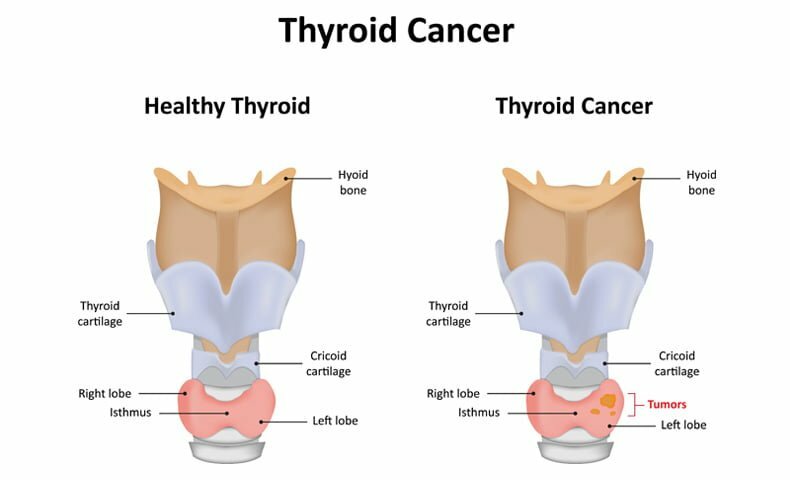 Thyroid cancers begin in the thyroid gland located in the front of the neck. 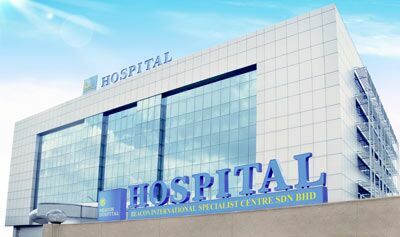 This cancer occurs more commonly amongst women and in Malaysia, females are approximately 68% more likely to get thyroid cancer than males (National Cancer Registry). Thyroid gland produces hormones in the body that regulates a person’s metabolism. The most common types of thyroid cancer is papillary thyroid cancer and follicular thyroid cancer. Both types develops in the follicular cells of the thyroid gland and grows slowly. However, papillary thyroid cancer often spreads to the lymph nodes, while follicular thyroid cancer rarely spreads to the lymph nodes. Staging of cancer is to describe the location of the cancer, where the cancer might have spread to and whether it is affecting other parts of the body. Below is a table that describes each stage. When detected early, salivary gland can often be cured. During the treatment planning process, the oncologist will have to consider the treatment impact on the patient’s quality of life, preferences and overall health. Surgery is the first recommended treatment option to completely remove the tumour. For salivary gland cancer, surgery to remove the parotid gland is an option, it is call parotidectomy. This type of surgery may include resecting the facial nerves if the cancer had spread there, if so a nerve graft will be necessary. If the cancer had spread to the lymph nodes, a neck dissection will be performed to remove the tumour entirely. Occasionally, but rarely, the tumour can be removed endoscopically which is less destructive to the healthy tissues. This option is used when the tumour begins in the paranasal are around the nose. Other treatment options are radiation therapy & chemotherapy. Surgery option for thyroid cancer is to consider removing the affected lobe. This surgery is call lobectomy. Depending on the advancement of the disease, a near-total thyroidectomy will be considered if the cancer had spread. This surgery type removes almost all but a small part of the thyroid gland. A total thyroidectomy is an option where the entire thyroid gland is removed. After the surgery, patients are required to undergo hormone treatment to replace the hormones the body needs. Radiation and chemotherapy are the next treatment option. 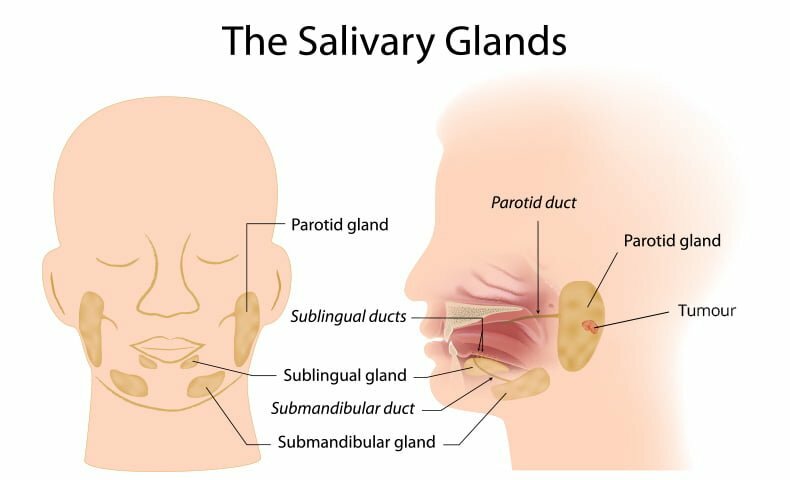 What causes salivary gland cancer is still unknown. Demographics and data shows that in most cases, people who are above 60 are at higher risk of having salivary gland cancer. Environmental or occupational expose to chemicals, pesticides and/or radiation could also result in developing salivary cancer. As for thyroid cancer, gender, age, race and genetics are a risk factor. Diet low in iodine can also hamper the normal function of thyroid. Radiation exposure can put one at risk for developing cancer thyroid as well.